This year’s theme, Connecting Communities, Business, and Educators for Resilience Solutions, builds on last year’s inaugural conference goals of broadening the capacity for resiliency planning in the state, and it serves as a forum to highlight the resiliency programs developed under Governor Terry McAuliffe’s administration. 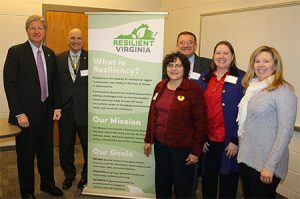 Secretary of Public Safety and Homeland Security and Chief Resiliency Officer Brian Moran with Resilient Virginia Launch Meeting organizers Jerry Walker, Annette Osso, Harry Gregori, Pamela Vosburgh, and Bryna Dunn at the February 19, 2015 Resilient Virginia Launch Meeting. Take away tools that can be used for resiliency planning in their own communities. 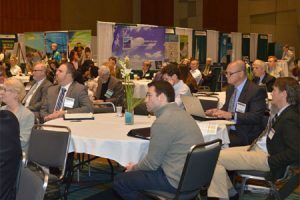 The 2017 Resilient Virginia Conference provides a unique forum to inform, educate, and activate communities across Virginia about the benefits of resiliency planning. Plenary sessions will feature national and state-level experts addressing the national security and community-building aspects of resiliency, as well as highlighting the economic value to both governments and corporations of adopting resiliency measures in their policies and operations. Breakout sessions will provide the opportunity for in-depth presentations on critical aspects of resiliency as it relates to challenges and risks faced by communities that range from extreme weather events and national security and public health issues to social and economic disruptions. Look for updates on speakers and topics as the agenda is finalized. Timothy W. Manning, President of Berglind-Manning l.c. Speakers in this session did not provide presentations. This mini-workshop provides an overview of community resilience planning targeted for those who are just getting started with their planning efforts. We will communicate the steps involved in developing a community resilience plan using the NIST Community Resilience Planning Guide as a framework. Attendees will learn how to form a team, involve stakeholders, identify community hazards, and develop strategy, all in effort to develop their own community resilience plan. The workshop includes individual and group learning activities, as well as interactive discussions to provide a dynamic experience for attendees. Those attending the session will walk away with a handbook that outlines the framework for their own community resilience plan, including a list of helpful resources and tips. VML/VACO Go Green Virginia Workshop. For registration, visit www.vaco.org/education/go-green/. 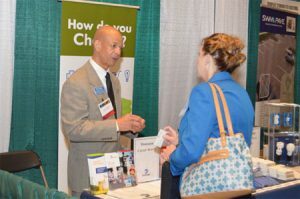 The 2017 Resilient Virginia Conference is an opportunity to showcase your business’ resiliency products and services and your organization’s resiliency programs to a highly focused audience. Sponsors will receive extensive publicity before and during the conference, as well as an exhibit booth, presentation opportunities, and a special reception. Exhibitors will be highlighted on the website and program, with opportunities to showcase their products and services at the August 1st Conference Reception. Please note: Exhibitor Registration is now closed. New this year! A special section of the Conference Exhibit Hall reserved for Innovative Technology and Solutions businesses. 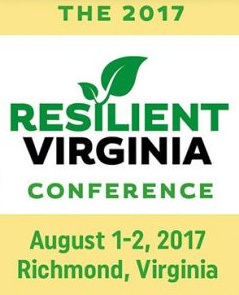 For sponsor and exhibitor information details, contact Annette Osso, Managing Director, Resilient Virginia (osso@ResilientVirginia.org). Sign up for The Daily Climate news via this link. Sign up for Environmental Health News via this link. Sign up for DCGreenScene news via this link. Sign up for Revitalization News via this link. Sign up for Security and Sustainability Forum News via this link. Sign up for Southeast Energy News via this link. Sign up for Zilient’s resilience news via this link. We are pleased that our Conference Planning Committee includes representatives from national organizations, state and local government, the private sector, and academia. Registration Questions? Please send an email to ncrowe@convention-connections.com.